Facebook is launching Instant Games, a new HTML5 cross-platform gaming experience, on Messenger and Facebook News Feed for both mobile and web. This new games experience allows people to easily discover, share, and play games without having to install new apps. Instant Games on Messenger, which can be accessed through the new game controller icon just below where people type a message, offers a fun and social experience featuring score-based games, leaderboards, and group thread conversations to challenge and compete against anyone on Messenger. 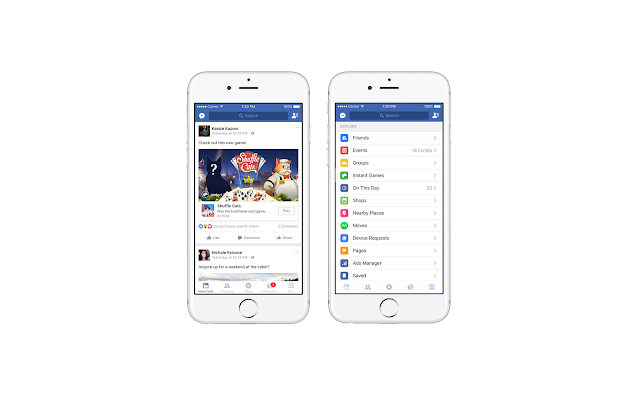 Instant Games can also be played on Facebook News Feed, enabling a seamless cross-platform experience where people can discover new games through recommendations, posts, challenges, and the Facebook Pages of individual games. A dedicated Instant Games bookmark is also available on Facebook where people can view and instantly replay all their favorite titles they previously enjoyed across both platforms. Players have complete control of their gameplay experience — sharing scores only with the people they're playing with in Messenger. Instant Games is currently available in 30 countries for iOS v8 or later and Android v5 or later.